← Stock up for the Holidays with these sensational savings on Revitalash products! For the love of fall, treat your face with the quintessential fruit of the season, pumpkin, and it’s skinsational benefits! Bursting with fall fragrances, this advanced treatment features a 15% pumpkin-orange enzyme boosted with lactic acid. Often referred to as “nature’s natural collagen,” pumpkin contains the highest content of Vitamin A and Beta-Carotene of any fruit, along with significant amounts of zinc. 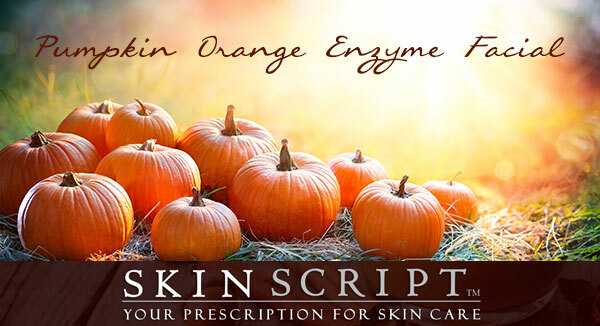 The naturally occurring enzymes in pumpkin dissolve dead skin cells while removing toxins deep within the pores. Paired with our Autumn Spice finishing mask; it contains nutmeg to sooth, cinnamon for increased circulation and glycerin and mushroom extract for added moisture. This anti-aging and super-nourishing treatment will brighten and soften your complexion to reveal a more-even skin-tone. Includes sonic exfoliation, light extractions, and a relaxing décolleté and facial massage.